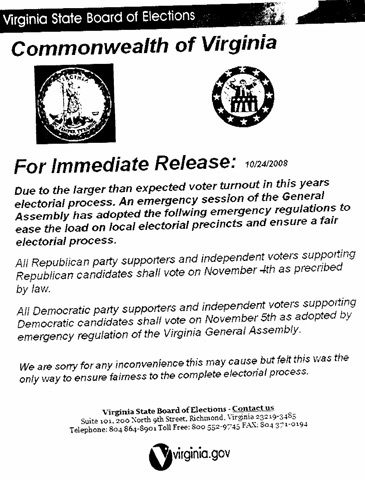 Virginia's State Board Of Elections has released a "rumor buster" document telling voters to disregard a flyer claiming that Democrats should vote on November 5th. "A fake flyer claiming it is from the State Board of Elections has been circulating, stating that Republican Party supporters shall vote on November 4 and Democratic Party supporters shall vote on November 5," the document states. "This information is false." Election Day, of course, is November 4th for all voters. Director of Communications Susan S. Pollard told Horserace that the source of the fliers is presently unknown, though the police are looking into it. She said it was distributed in predominantly African American areas, notably "Virginia Beach, Hampton Roads and Norfolk." Below, a copy of the flyer. Click here for the PDF.